All NEST students pace through a common, field-based NEST curriculum. 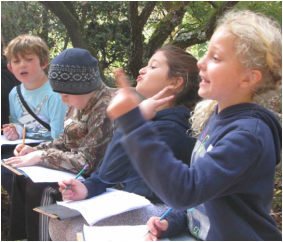 This outdoor learning sequence begins in pre-school and extends into middle school, with emerging high school programs as well. The programs begin at the Nature Center and expand to sites throughout the county as children grow older. The systemic nature of our curriculum means that that a child in our community can continue to build her environmental literacy even if she switches schools. Learning with Boxerwood unites all students whether they attend school in Buena Vista, Lexington, or Rockbridge County. Building on previous pre-kindergarden outreach, these programs continue to develop student senses, wonder, and nature-based literacies. Instructors use story-telling, puppets, and content-rich activities to introduce students to key creatures and features of the natural world. 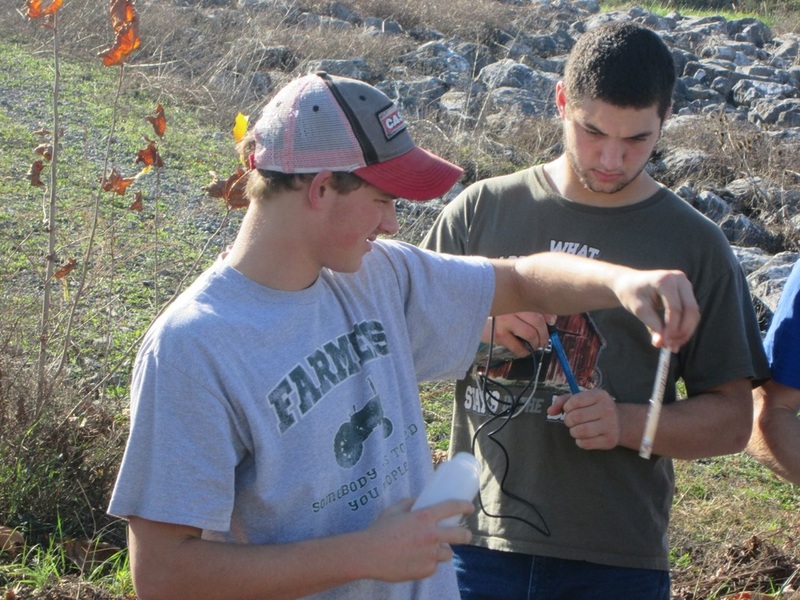 Students learn together as a class or half-class, completing simple field-work journals with their field instructors. Students investigate the properties of our important natural resource, water, as flowing from natural sources at Boxerwood. Program concludes with supervised free play in nature on Boxerwood's Play Trail. Students compile a travel guide to the natural world with a special interest in trees, plants, and seeds.​ Program concludes with supervised free play in nature on Boxerwood's Play Trail. Lost in the Woods| 2 hr. Students practice mapping skills including reading a compass while finding their way through a literary adventure. Students explore Boxerwood’s pond and learn about animal adaptations. 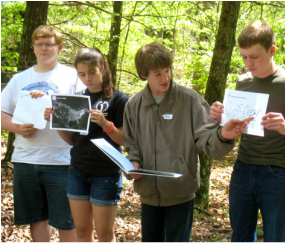 Programs address grade-specific content while actively engaging students as scientists and earth stewards. During each thematic program, students rotate through three (or four) 50-min. small group activities led by Boxerwood educators. Students enter data or complete prompts in program-specific field journals as part of each lesson. Students learn the Boxerwood method of "Think Like a Scientist" in order to complete a data-driven habitat assessment; they also map signs of life around wetland and construct a habitat for a tiny clothespin explorer. Students apply the same "Think Like a Scientist" method to a new question about decomposer habitat. They also learn about the marvels of compost and carry out a service project that protects soil. Working as scientists, students gather data for an ongoing investigation about resident turtles and frogs. They also "travel" through the water cycle in a sensory-rich adventure, and carry out a service project that protects aquatic life. Working as detectives, students determine how well Boxerwood is protecting its watershed. In the process, they participate in a Save-The-Bay interactive role play using a 6 ft. custom-made watershed map, tour the Boxerwood waste water treatment system, and carry out chemical testing of the Boxerwood pond. Students apply skills learned from their Water Trackers program to assess the health of a stream or river near their school. In addition to working as chemists, the students also participate in activities that invite them to consider the river as poets (river haiku), and biologists (stream ecology). As archaeologists, they handle and sort a number of Native American artifacts previously gathered from a river-based site in the Rockbridge. Returning to the site of their 4th grade stream program, students monitor and compare the stream in a new season, using both abiotic and biotic sampling protocols. They also connect to the site as geologists (fossil activity) and artists (water-color painting). NEST tailors its programs at this level to the varied sizes, schedules and teaching configurations of our three middle schools. Science teachers play a greater instructional role with Boxerwood staff in a supporting role. 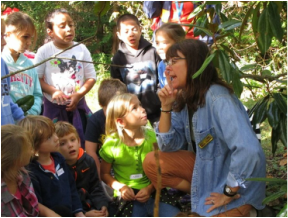 Emphasis is engaging students grade-wide in authentic projects that support science SOLs and help the natural world. The approximately 60 students at LDMS complete a day-long watershed investigation at nearby Jordan's Point Park (confluence of Woods Creek and the Maury River), to which they walk. Students rotate by homeroom through four, 55 min. sessions. They conduct abiotic and biotic water sampling in two sessions. They write poetry or create water color paintings by the river for the third session. In the fourth session, they piece together 250 years of history of the once lively waterfront using prior knowledge (an in-class component taught by their English teacher), primary documents (old photographs and maps), and a walking investigation of the area. Select students participate in a LDMS Chesapeake Bay Club and related service. 200 students and their science teachers participate in the MRMS Woods Creek Project by gathering and testing water samples from nearby five test sites. They access these sites by bus during their science periods at school. Students also complete a geology lab in the oldest section of a nearby historic cemetery in order to determine the impact of physical, geological, and chemical weathering on rocks. Half of the classrooms also participate in Trout in the Classroom activities. 200 students and their science teachers gather and share biotic data for the Woods Creek Project (as above) during 30 min. field trips taking place in their science periods. All students participate in Trout in the Classroom activities. Up to 40 belong to the Chesapeake Bay Club. 30 Students in two advanced physical science classes support the MRMS Woods Creek Project by performing conductivity tests on collected samples and sharing the results. Students also participate in the St. Mary's Wilderness Project, a two-day, overnight program that draws on their knowledge of chemistry, biology, and geology to solve a biological riddle related to native trout populations in the Blue Ridge Mountains. ​75 students and their teachers walk from PMMS to Glen Maury Park for a day-long watershed investigation. They tour the Buena Vista Wastewater Treatment Facility, meeting operators and engineers. Working in small groups, they also conduct abiotic and biotic water monitoring upriver from the facility, assessing the health of the Maury as it flows through Buena Vista. Students participate in the Trout in the Classroom Program. Select students participate in the Chesapeake Bay Club and related stewardship activities. NEST commenced its first pilot program at Parry McCluer High School during 2015-16. Goal is to engage the majority of Geology classes in monthly, field-based water monitoring of Noel's Run as it courses through Buena Vista from the Blue Ridge mountains to the Maury River, a distance of about two miles.